T-Mobile is making good on its promise to expand MetroPCS coverage with the launch of 15 additional markets less than three months after finalizing their merger. 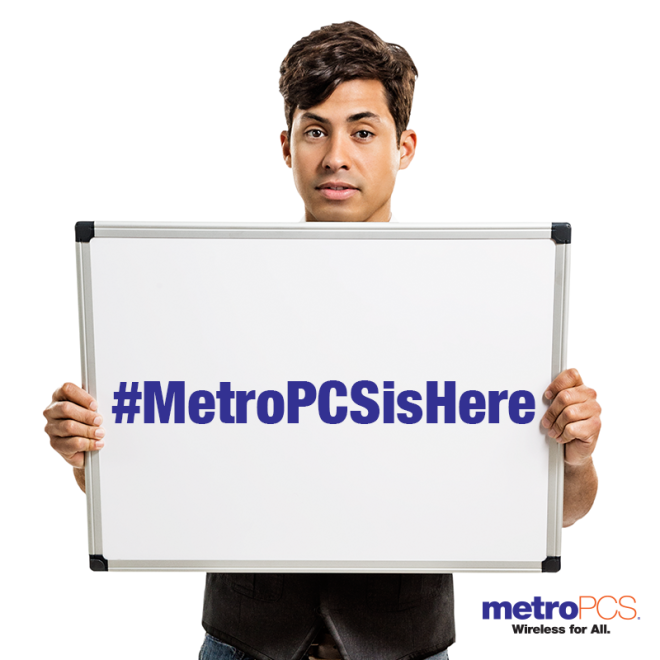 MetroPCS will introduce two new smartphones, the Nokia Lumia 521 and LG Optimus F3 in the new cities along with six additional models and the company’s bring your own device option. Wait, that’s not all as MetroPCS also introduces a “$40, period” rate plan that includes unlimited talk, text and 500MB of high-speed data along with all taxes and fees for $40 per month.
? Seattle and Tacoma, Wash.
MetroPCS offers consumers everything they want from their wireless experience without an annual contract or paying an arm and a leg. At a tremendous value of ‘$40, period,’ MetroPCS is bringing its convenient neighborhood access, great service and unparalleled value to more people and connecting them to T-Mobile’s powerful nationwide 4G and 4G LTE network. MetroPCS customers will experience speeds on average of seven times faster than the company’s previous markets. BELLEVUE, Wash. – July 25, 2013 – T-Mobile US, Inc.’s (NYSE: TMUS) wireless revolution marches onward. Less than three months after completing the combination of T-Mobile USA and MetroPCS, the company has doubled its MetroPCS brand presence across the country and is bringing “Wireless for All” to 15 new markets. MetroPCS is offering its ‘all-in’ unlimited data, talk and text service – taxes and regulatory fees included – online and at authorized dealer stores in its existing 15 markets, as well as the additional below operating markets announced today. The company is also offering its “Bring Your Own Phone” program to all of its customers, providing them even more choice and great value. MetroPCS has grown to the #1 no annual contract wireless network brand in the majority of the markets it serves by offering convenience, choice and flexibility for consumers who work hard for their money and deserve more than what they’re getting from their carrier today. Consumers will enjoy a wide variety of phones — with access to a nationwide 4G and a growing 4G LTE network, which now reaches 157 million people in 116 metro areas— including the latest 4G Android(TM)-powered smartphones like the Galaxy S® 4, LG Optimus L9(TM) and Samsung Galaxy Exhibit(TM). In addition, to bolster its line-up in new markets, MetroPCS also announced the availability tomorrow, in select markets, of the Nokia Lumia 521 and LG Optimus F3(TM) to its 4G smartphone portfolio, delivering more handset choices at speeds wireless consumers need for a great mobile experience. Along with a powerful lineup of smartphone choices, MetroPCS’ “Bring Your Own Phone” program enables consumers to pair their compatible device with MetroPCS’ affordable 4G service plans, giving them more choice, more savings and more for their money with access to a nationwide 4G network and unlimited – taxes and fees inclusive – for just $40 a month. I have yet to see a metro PCS location in near or around Cleveland. I can’t speak for Cleveland, but in Tallahassee, metroPCS had only spectrum here. A third party dealer opened near me last week… I figured that they’d be selling GSM phones since there is no CDMA service here… And lo and behold. We have at least 1 store spotted a little rough at the moment just a banner on a old building. But I’ve seen a nice metro billboard up a few miles down the road. Did see a banner hanging for MetroPCS in Germantown, MD, so definite confirmation in the DC Metro area. It’s good to see my area is included in the new MetroPCS list. However, the $40 deal doesn’t entice me to jump from the Walmart plans that I use. It goes up in price (strike #1), up in minutes (useless, so strike #2) and down in high-speed data (strike #3). Up in price?? Well damn, what were you paying before? Question???? Are these new locals on Metro PCS CDMA band or T-mobile GSM? I hope it’s T-Mob, because that would only make any sense? Just brand the phone Metro PCS and give them T-Mob products, right? No one is the wiser…..I hope that’s what they are doing. They are on T-mobile’s GSM network. It was also a shot across Cricket’s bow as half of those markets were Cricket that had no metopcs competition. Probably a good thing ATT bought them. I think it’s very smart for T-mobile to get as many people to jump from Cricket as possible before the ATT buyout finalizes. At least AT&T has to wait for the Leap Wireless purchase to be approved before they can copy this one via Cricket. Use those months wisely T-Mobile! They are going to dismantle Cricket within 2 years or ruin it with price hikes. I doubt they are going to improve it. AT&T has already made their pre-paid smartphone plan cheaper, Unlimited Talk & Text plus 2GB data for $60. per 30 days. And they now offer their own MVNO called AIO for $55. So, AT&T is wanting to be competitive in the pre-paid market, they’ll most likely want to stay that way. I hope AT&T uses it to expand their AIO Wireless experiment. This is great news! T-Mobile is smart 13 out of 15 are Cricket Markets lol time to steal customers from our competition lol I hop t-mobile has new markets coming soon as well. South Dakota and North Dakota would be a good place to start. So dose that improve coverage for Tmobile customers? No. They’re only expanding the MetroPCS brand to multiple markets. It uses Tmo’s existing network. So if youre in a market that has MetroPCS and Tmobile and are only using HSPA+ (ie Galaxy Nexus) , do you get the same coverage on MetroPCS? I was at Wal-Mart last night and saw a lot of marketing for MetroPCS, maybe Wal-Mart spilled the beans and Phoenix, AZ is next! Hmm, so they have finally made their way to my city (Houston) now. I guess it’s time to compare plans and pricing. So won’t this eat into T-Mobile’s market share? It’s $10 less a month than T-Mobile, plus it axes the 25% post paid taxes on T-Mobiles stuff for the same thing? Also Walmart Family Mobile, now for $39.88 per month with additional line in at $34.88 is the same thing yet you get 2.5 gigs of Data at high speed rather than only 500mb? Well, Family Mobile only does 3G speeds, so it’s a bit different than T-Mobile’s main line offering. 3G? where do they have 3G? I get 2G everywhere! Hopefully T-Mobile customers take priority over Metro when they are on the same network and it gets to congested in an area. I know thats how it is with Go Smart Mobile thats owned by T-Mobile and uses T-Mobile’s network. Go Smart Mobile is cheaper than Metro PCS and has unlimited plans. The only catch is you take a back seat when T-Mobile customers need to make call, text, and use data if the network doesn’t have room at that time. I think T MOBILE needs to step up and do a counteroffer and go after LEAP I don’t want at&t to have them !!! Nice prices. Are MetroPCS phones unlocked when purchased? Or will they unlock them? I would like to use them on T Mobile! When I got the F3 she said it was unlocked already without me even asking.. Picked up the new Optimus F3. It’s an excellent device. Im surprised how fast the Lte is running on Tmobiles network. It’s faster then my wifi! The camera & everything is good too. Id recommend over the L9 if you dont care abt the difference in screen size between 4 inch on it & 4.5 on the L9. Is there any difference between the Metro PCS $40 per month plan and the T-Mobile $50 per month plan? I am in Las Vegas. The cost difference would be about $15 per month total since a $50/month plan would run about $55 with taxes and Metro’s plan includes them.